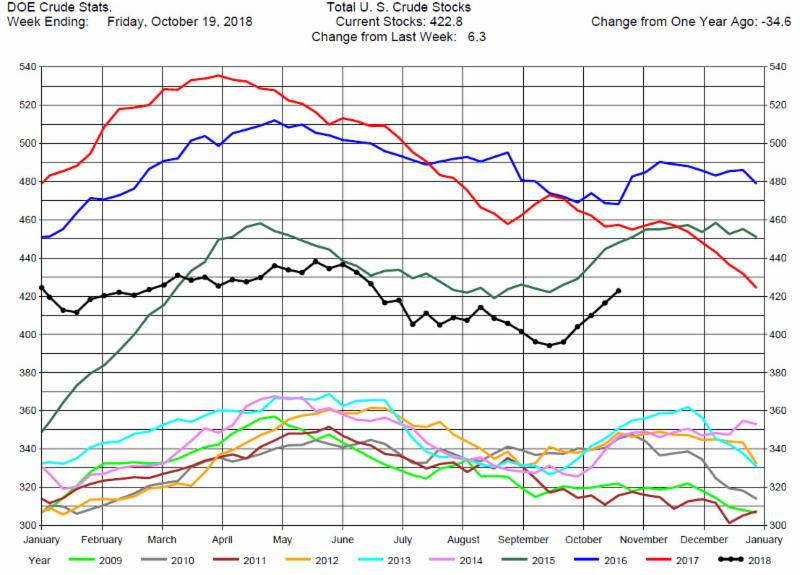 The DOE reported Total Crude Oil Inventories increased by 6.3 million barrels to 422.8 million barrels for the week ending October 19, 2018, while expectations average was for a 3.8 million barrel increase. 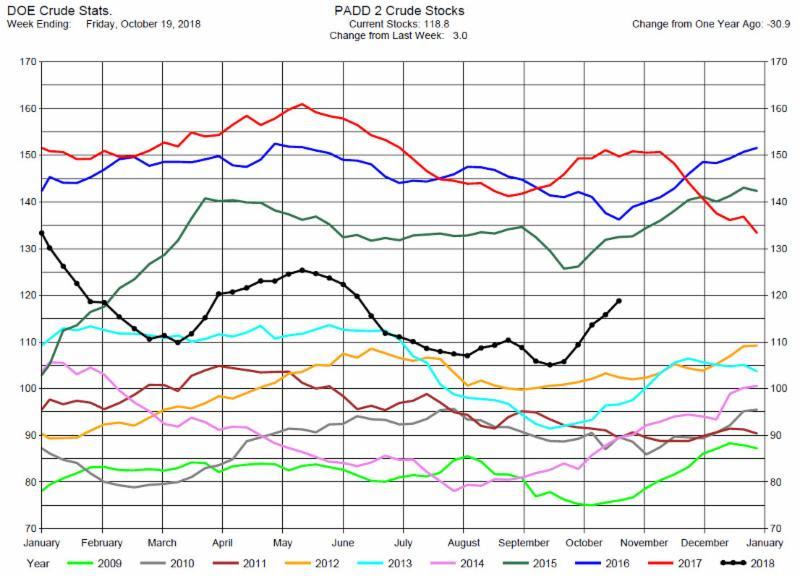 The range of expectations was from a 2.0 million barrel draw to a 8.7 million barrel build. 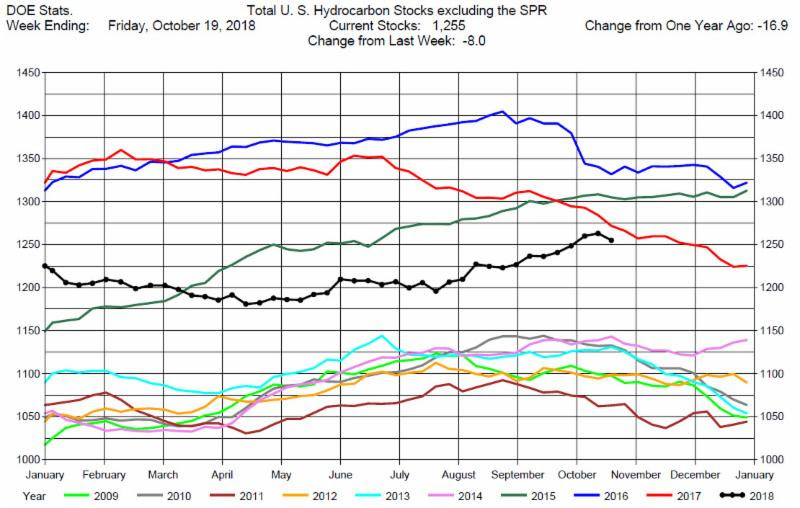 Overall hydrocarbon supplies decreased by 8.0 million barrels to 1,255 million barrels. 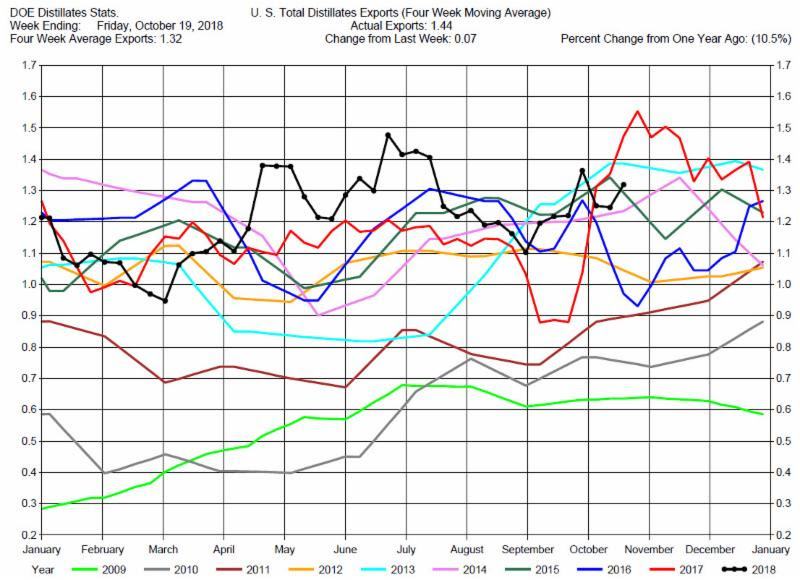 Crude Oil Production was unchanged at 10.9 million barrels per day. 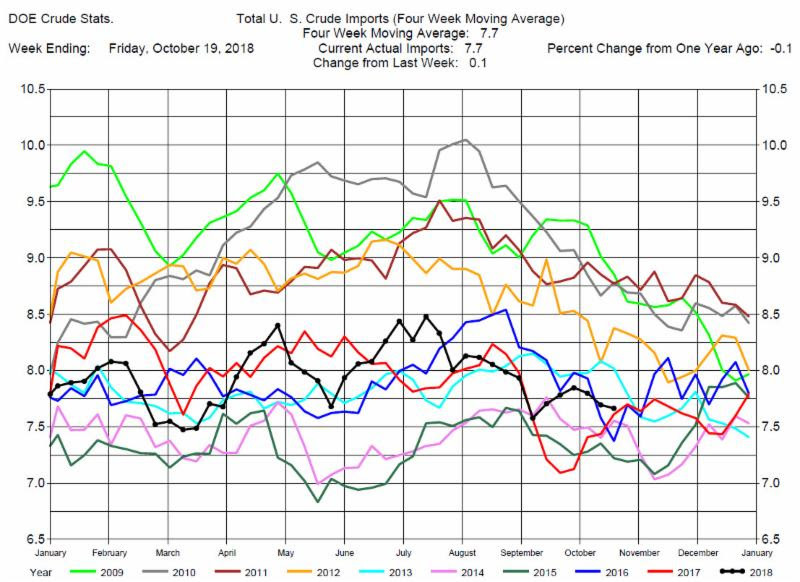 Total Crude Imports were up by 100,000 barrels per day to 7.7 million barrels per day. 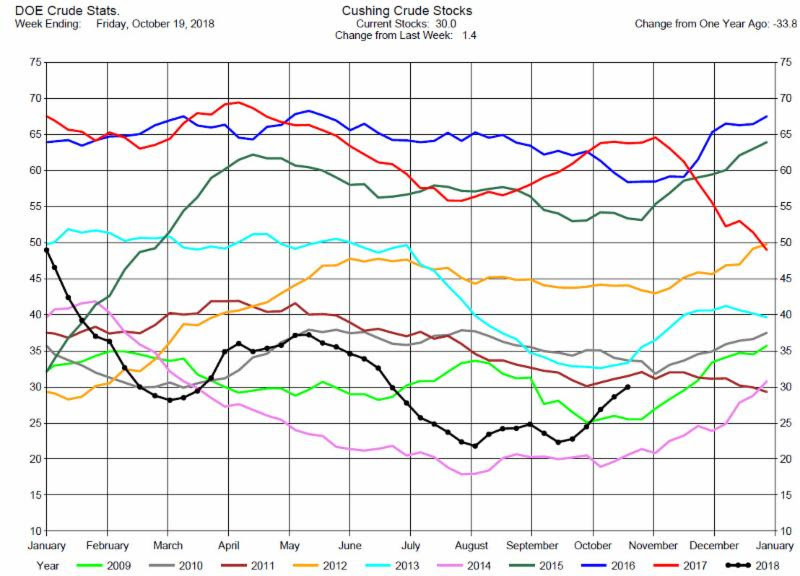 Total Refinery Crude Runs were unchanged 16.27 million barrels per day. This report was actually bearish for crude oil prices but the market initially rallied. Then at mid-day prices reversed and ended the day basically unchanged. With this increased volatility in the market we would recommend to be on the sidelines. 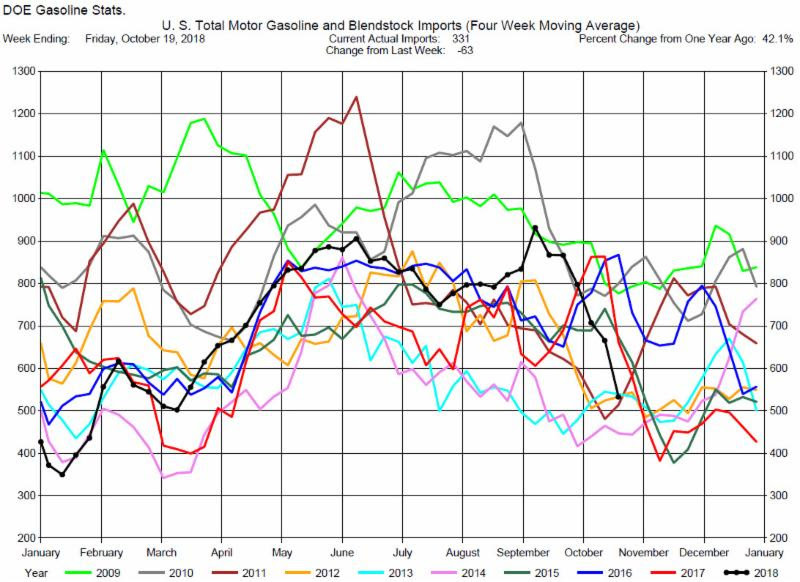 Total MotorGasoline Inventories decreased by 4.8 million barrels to 229.3 million barrels for the week ending October 19, 2018, while expectations average was for a 1.7 million barrel decrease. The range of expectations was from a 1.0 million barrel draw to a 3.8 million barrel draw. Implied Demand was up by 140,000 barrels per day to 11.0 million barrels per day. 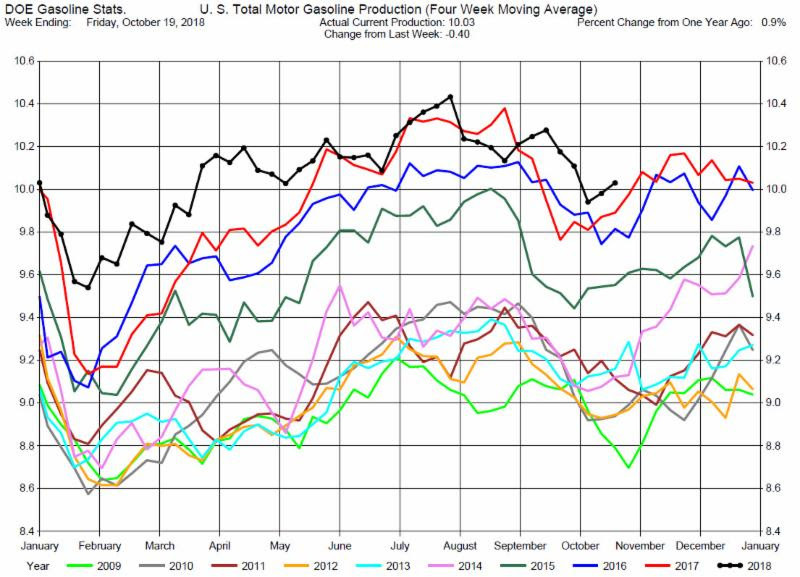 Gasoline Production was down by 400,000 barrels per day to 10.03 million barrels per day. 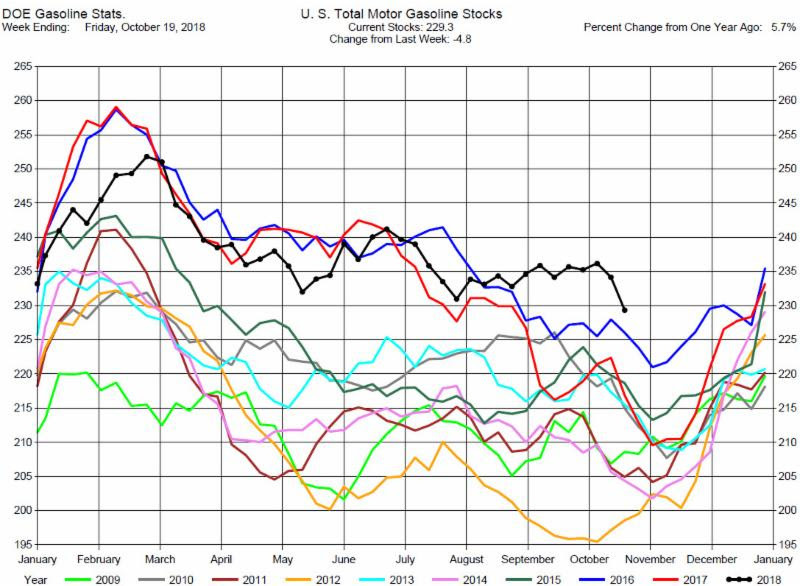 Gasoline prices have decreased dramatically over the last three weeks. Fundamental data is bearish to prices so we recommend consideration of short positions. 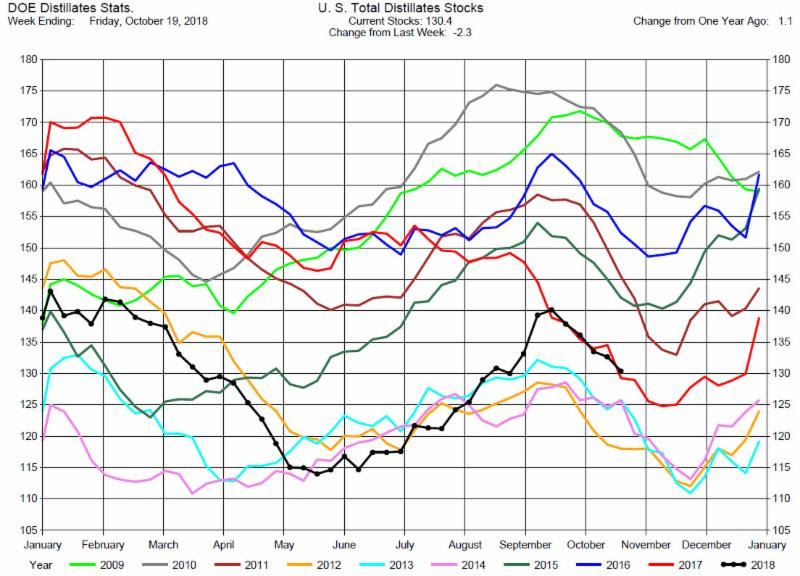 Total Distillates Stocks decreased by 2.3 million barrels to 130.4 million barrels for the week ending October 19, 2018, while expectations average was for a 1..8 million barrel draw. The range of expectations was from a .5 million barrel draw to a 2.8 million barrel build. 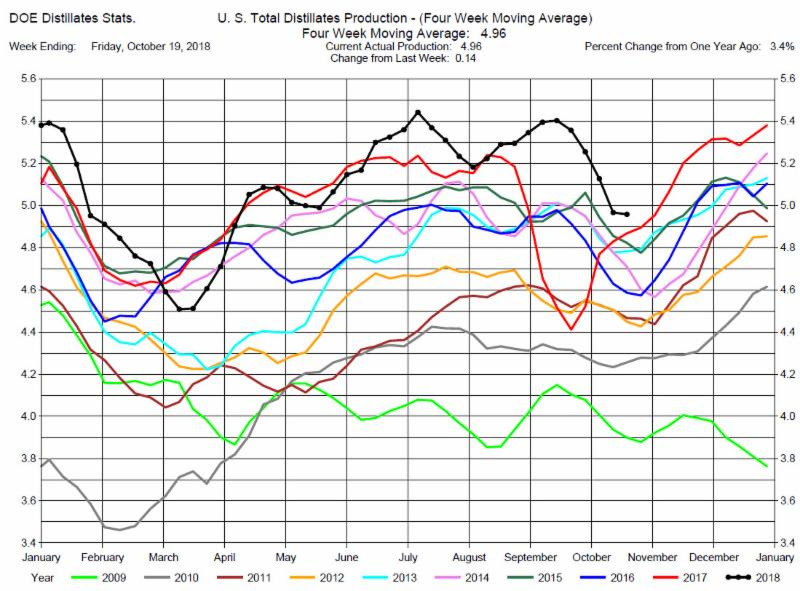 Total Distillates Production was up 1400,000 barrels per day to 4.96 million barrels per day. 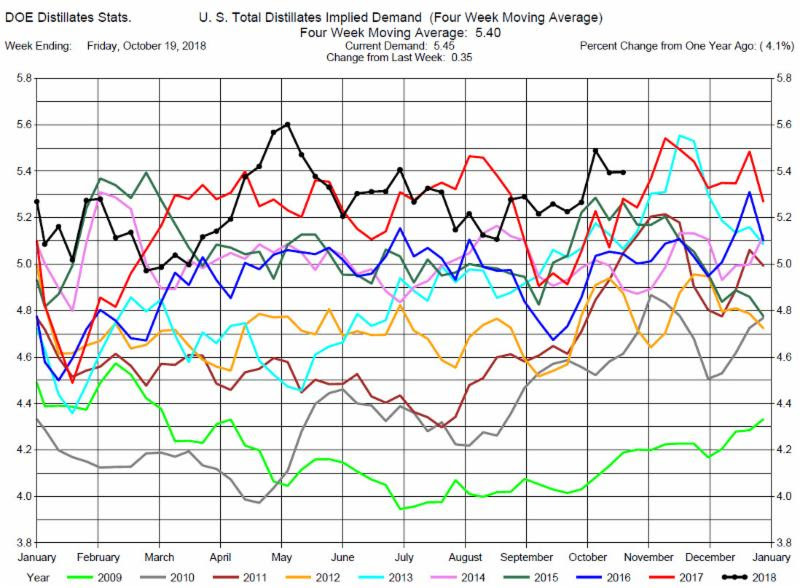 Total Distillates Implied Demand was up 350,00 barrels per day at 5.46 million barrels per day. 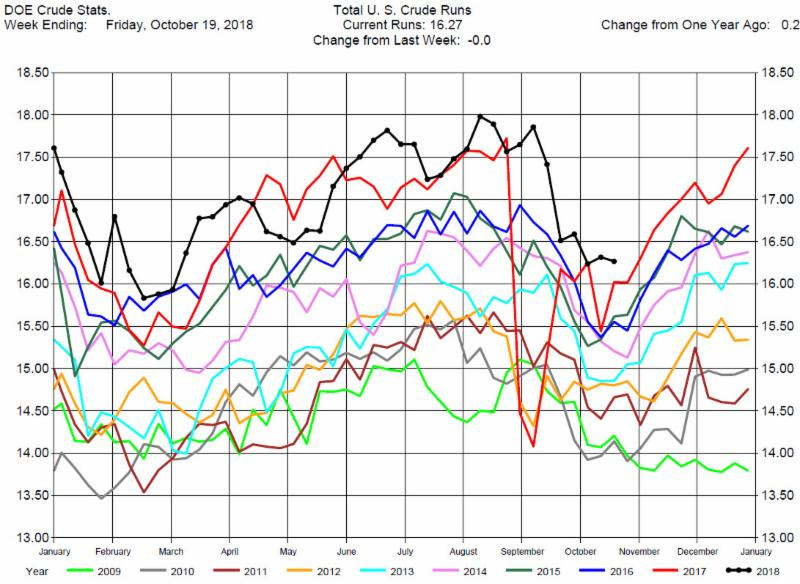 Heating Oil prices have decreased but not as dramatically as Gasoline prices over the last three weeks, mostly in tandem with Crude Oil prices. 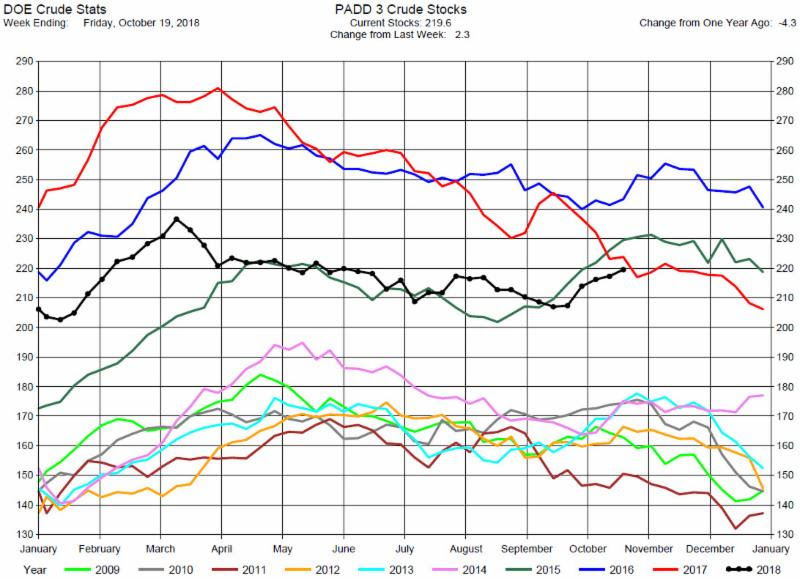 However as Crude Oil prices have decreased faster than Heating Oil prices, so the Heating Oil Cracks have strengthened. We suggest consideration of long positions in the Heating Oil Cracks.